ChristianCafe.com is a dating experienced designed exclusively for Christians, and is committed to matchings Christians for serious, long-term relationships based on mutual beliefs. The site claims that for the past 16 years, 50,000 Christians married after meeting on the site. That’s more than four marriages for every day ChristianCafe.com since it’s launch. 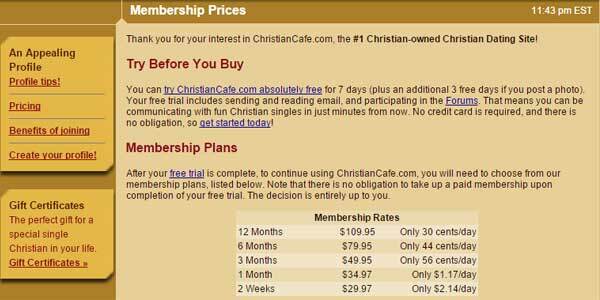 One of the most attractive features about ChristianCafe is that you can sign up for a free full version, 7-day trial. No features are held back. You can instant message, join the forums, send emails, and use the search and match features just as if you were paying a full membership plan. ChristianCafe is also allied and affiliated with Focus on the Family. Focus on the Family supports the site by contributing to the site’s blog posts, and providing trusted relationship and dating advice. The free sign up starts with the choosing of a gender, country, and age. The site then asks some questions one at a time: username, email, and location. It may take some time, but it will give the site more data to find your matches. After those basic questions, you fill in a profile sheet. The data won’t save until you’ve answered every box, so you’ll be sure not to miss one. These fields include marital status (no legally married users allowed on the site), race, fashion sense, Christian faith (from “It defines who I am” to “I believe in God”), church involvement, and salary. The “Christian” side of the sign up comes in the short essay questions. They ask for meaningful Scripture verses, your description of your faith, and Christian goals. Otherwise, they are all classic get-to-know-me questions. Because all users sign in with usernames rather than real names, anonymity can be preserved on the site. You can also hide your city from your profile to better protect your location. They also have technology that helps to filter out scammer profiles from the site. “Mailblocks” also allow you to block communication from any member on the site, whether email or IM. If you are a trial member, you are not allowed to send any personal information over an email or instant message. The uncomfortable flip-side of that is that as long as you are a paying member, you are allowed to send personal details through the site, and view anyone else’s. ChristianCafe also does not conduct identity authentication checks. For 2 weeks, users pay $2.14 a day, or $29.97 for the entire time period. For 1 month, users pay 46% less: $1.17 per day, or $34.97 for the month. At 3 months, the rate goes down 53%, to 0.56 cents per day; $49.95. At 6 months, the payment is 0.44 cents a day, $79.95 for that half-year; 22% lower. Last, at 1 year, the payment is 30 cents a day, $109.95 for the year, 32% lower. There is no difference when accessing the different membership plans. The only difference is between the trial members and the paying ones, since only paying members may send personal information over the website and access the chat rooms. 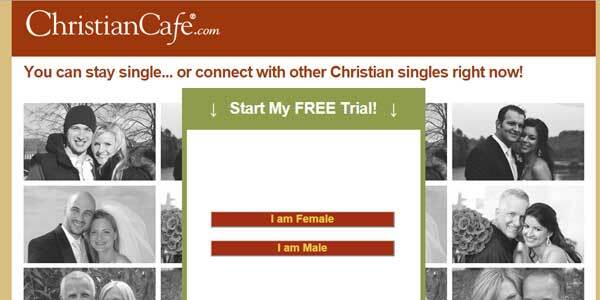 TheChristianCafe profile is relatively easy to fill out and use. The only part that may bother some users is the fact that you cannot skip certain fields or questions. Most of the answers are drop-down (multiple choice), which makes it easier. The number of short-answer essay questions is low, and they are not very complicated. While this makes the site more or less “easy” to use, the lack of detail also makes it more difficult to find matches, or to express yourself. It is also rather difficult to tell a lot about another’s faith without more detailed questions on what he or she believes. Under the “search” menu, there are several ways to get in touch with other users on the site. One of the quickest and easiest is the aptly named “Quickmatch.” It takes the personal details you have on your profile, including age, Christian faith, and location, and pulls out profiles that match yours, simplifying the initial search. You can also have a customized search, and detail the profile of the match you want. You can save those search settings, and simply run them again whenever you log on. This makes it much easier to navigate profiles on the site. You can also see who’s online, and message them if you want. The search is simple and easy to use on this site. Christian-owned and Christian-populated, ChristianCafe is a place where Christian singles can find others of their own faith who are also searching for a partner. More importantly, the forums and chat rooms allow the singles to be in a community with one another on the site. The site is also easy to use and navigate, which makes the experience better. ChristianCafe.com is a site that provides an encouraging dating experience where you can meet like-minded individuals andfocus on finding your match. 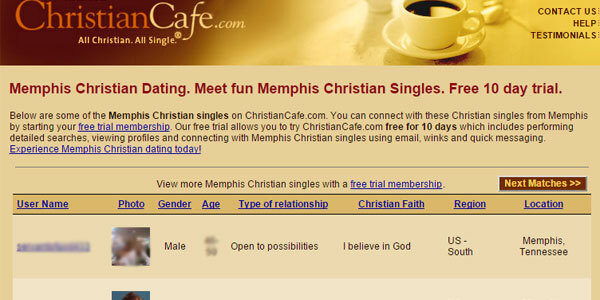 Not sure if ChristianCafe is the best dating site for you? Check out ChristianMingle - another popular dating site for Christian singles.